Our goal with this event to have some fun and to give fellow equestrians the chance to meet and talk to some local professionals. Featured guests will include Marcus Rhatigan Trainer, Dr. Rothacker Salmon Brook Vet's Equine Vet, Lisa Roddy Equine Massage, Margaret Stewart Animal Healer, Marty Whittle Equi-Yoga, Jeffrey Fleming Fitness Coach and more! Each will be available to discuss the upcoming season and answer any questions that you may have. Complimentary snacks and soft drinks, wine available for purchase. Marcus will be available to answer questions about clinics, lessons, young horse training and the show schedule for the upcoming season. “To be able to truly train a horse, you have to understand them from the inside out. Horses use intuitive and instinctive behavior for all aspects of their life, so it is only natural that we need to use our intuitive side to communicate with them, to gain a strong and positive working relationship”. Marcus uses a systematic program for his training. His training methods are intuitive and instinctive as well as pragmatic. Horses in Marcus’ program first undergo a physical assessment; are there any physical issues that need to be considered during their training? Marcus then follows a series of steps to introduce the horse into his new line of work, or in some cases reintroduce the horse into his work. Again, Marcus uses a systematic but intuitive approach both with his horses and riders. Dr. Rothacker will be answering questions on show prep, vet care and other equine health questions. Dr. Rothacker was born in Idaho on a quarter horse ranch. After moving to Putnam County, New York, she continued riding as a working student in a hunter/jumper barn. She completed her undergraduate work at Bucknell University and veterinary school at the University of Illinois. Following graduation in 2010, she moved to New Zealand for a one year internship at a Standardbred racetrack practice. She returned to the US and completed a large animal rotating surgical and medical internship at the University of Pennsylvania's New Bolton Center. Dr. Rothacker stayed on at New Bolton first as a resident in Ambulatory and Sports Medicine and then as a lecturer in the Field Service department. She became board-certified by the American Board of Veterinary Practitioners in Equine Practice in 2014. Dr. Rothacker's specialties include lameness and diagnostic imaging, pre-purchase examinations as well as routine preventative care. Also an animal communicator and dowser, Margaret performs energetic clearing and distance healing work. Margaret integrates all modalities and expertise into her work with animals and people. Equi-yoga™ is a practice developed by Marty Whittle combining the benefits of yoga, breath and movement. Horses mirror our breath and body language. These unique yoga based exercises are designed to help stretch, strengthen and create awareness of the rider’s body. Using these exercises in unison with your breath and your horse's movements, you can stretch and release tension from deep within and thereby achieve a better awareness of all individual body parts and their unity. By learning to breathe correctly, engaging the diaphram and becoming aware of specific muscle groups, you can then unite with your horse's energy. Parts of the body which might be locked can be addressed and opened. The horse's response to your awareness of all individual body parts and their connection to him is the reward. Specific exercises can target and unlock trouble areas such as the neck, shoulders, arms, back, seat and legs. By unlocking these areas you allow your horse to flow through you. Lisa's love of horses and experience as a nurse led her to pursue equine massage. 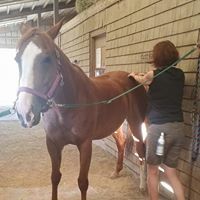 Equine Massage Therapy is the therapeutic application of hands-on massage techniques for the the purpose of increasing circulation, relaxing muscle spasms, relieving tension, enhancing muscle tone and increasing the range of motion for our equine partners. Jeff will be on hand to answer any questions you have on getting fit for the riding season. The primary goal of a rider fitness program is to build stamina and strength. All riders should have a strong core, good balance, good general flexibility, and a fairly high level of awareness of where your body parts are in relation to your body and movement. Jeff is a personal trainer as well as founder of Team DriveTrain Fitness. As a Clarity Coach, Kristal works with people to help them reach their potential and accomplish their dreams. Let Kristal help you remove the barriers from your riding! Lynn Guelzow will be providing info on the Granby Pony Club, and their adult group, Horse Masters. Maple View Farm is geared to beginner riders age 5-14 and strives to develop self-sufficient equestrians who are able to care for, and ride a horse by providing a broad education which fosters an understanding of various equine disciplines and theories. Summer Session offers an opportunity for beginner students to learn horsemanship and farm skills through games and activities. Students are divided into small groups for mounted and unmounted lessons on how to tack up a horse; names of the parts of the horse, saddle and bridle; and daily care for all of the farm animals.